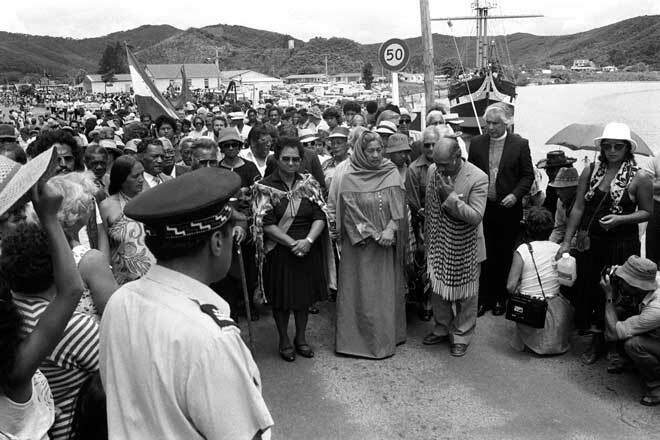 Raglan kuia (female elder) and activist Eva Rickard (in headscarf) and other prominent Māori radicals lead the protest march on Waitangi Day 1984. They are walking from the marae at Te Tii (in the background) across a narrow bridge to the Treaty Grounds. By this time Waitangi Day protests had grown so large and intense that a heavy presence by police and Māori wardens was required to prevent disruption of the official celebrations.